At the worldly level, we can see the benefits of truthfulness. If we are known to always tell the truth, our friends will not doubt our words and agreements can be concluded easily. If we are known to lie all the time, our friends will not even bother to listen to us. I observed that people who often tell lies are often unconvincing and they are often not able to articulate their thoughts clearly. Perhaps the negative karma of telling lies has the effect of taking away the power of influence from their speech. A friend told me about a contractor who is known by his clients to be honest and truthful. One day, he supplied two equipments to the renovation site of a client. The client was not at the location, so he left the equipments at the site. However, some other contractor stole one of the equipment due to a lack of security at the site. When the client called the contractor to check why he only delivered one equipment, he explained to the client that he delivered both equipments there. Because of their long and honest relationship, the client did not doubt his words and agreed to pay him for both equipments. When one tells the truth all the time, not only will others trust him, the universe has no choice but to comply with what one says. In his book, the ‘Autobiography of a Yogi’, Paramhansa Yogananda tells a story which illustrates this point. Once, Yogananda’s sister pleaded to him to help her gain weight. Yogananda knew that because he has never lied for as far as he can remember, what he says will become a fact. He told the sister that after a certain period of time, she will gain the weight that she desired. Needless to say, she gained the precise weight she desired after the period mentioned by him. In another story, Yogananda sat for an examination paper and later found out that he was supposed to answer one question in Part A and another question in Part B but he mistakenly answered two questions in Part A instead. Therefore, his maximum mark would fall short of the minimum passing mark. When he explained his predicament to Sri Yukteswar, his Master replied, “The sun and the moon would sooner change places than for you to fail your exam”. Later, to his delight, Yogananda found out that the minimum passing mark for the paper was reduced to the maximum mark that Yogananda could have obtained. He eventually passed the paper. When he thanked Sri Yukteswar, his Master explained to him that the universe merely found it more convenient for him to pass his examination than to shift the sun and the moon! In his book, ‘Living with the Himalayan Masters’, Swami Rama told a beautiful story about how truthfulness will always prevail. In the story, a station master approached Swami Rama and his Master as they got off a train and asked them for a spiritual practice. His master advised the station master, “From this day on, don’t lie. Practice this rule faithfully for the next three months”. Unfortunately, in the same week, a supervisor from the head office conducted an audit on him. The supervisor asked him probing questions about corruption at the station and he answered honestly. He not only got himself into trouble, he also implicated the other employees at the station. The other employees later ganged up and lied that the station master was the only one taking bribes. The station master was brought in front of a judge. When the judge asked him if he needs a lawyer, he responded that he did not need one and only wants to tell the truth. He then explained to the judge about the practice given to him by Swami Rama’s master. The judge adjourned the case and brought the station master into his chambers. The judge questioned him about the master and found out that the master mentioned by the station master was actually his guru. He acquitted the station master and said, “You are on the right path. Stick to it. I wish I could do the same”. During the ordeal, the station master’s wife and children left him and he lost his job. However, he persevered on his practice. Exactly three months after meeting Swami Rama and his master, the man received a telegram informing him that his father had a plot of land which was taken by the government and the government now wants to pay him a huge compensation for the land. He did not even know about this land. He gave the money to his wife and children. When they expressed the desire to go back to him, he responded, “No, until now I have only seen what happens by not lying for three months. Now I want to find out what will happen if I do not lie for the rest of my life”. He is incapable of hiding whatever evil he does, whether deed, word or thought; for it has been said that such an act is impossible for one who has seen the Path. On account of this truth, may there be happiness! The Buddha protected the people of Vesali by sharing spiritual truths and using the creative force of truthfulness to bring abundance and healing to the city. After he gave the discourse, the city was freed from the suffering that engulfed it. 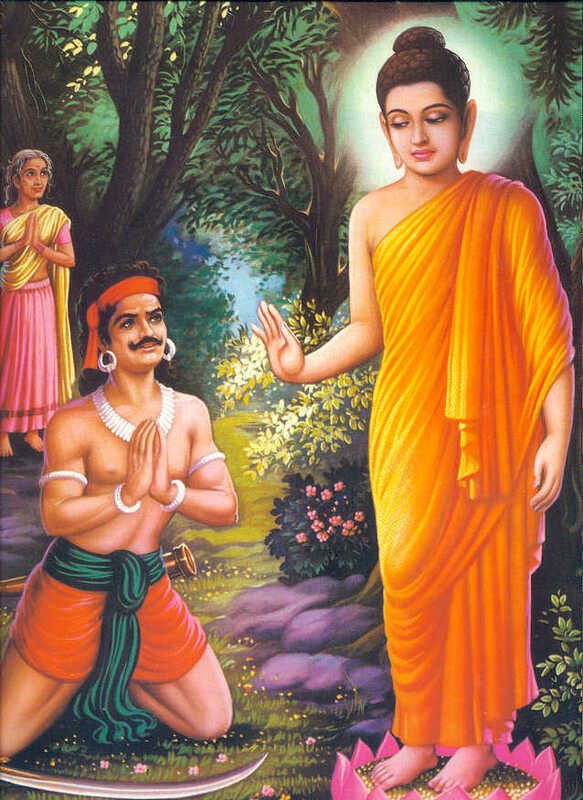 The Buddha once converted a serial murderer named Angulimala into a loving monk who is incapable of harming even an insect. Long after he became a monk, Angulimala, came upon a house where he heard the cries of a mother undergoing a protracted labour. Not knowing how to help, he rushed to the Buddha for help. The Buddha told Angulimala to recite the following prayer to the expectant mother, “Sister, from the time of my being born in the Noble Birth (self-realisation), I do not know of myself having purposely deprived any living creature of life. By this truth may you be safe, may there be safety for the child in your womb”. Angulimala did so and the mother delivered the baby without further difficulties. This truth told by Angulimala is so powerful that even now, Buddhist monks chant this to bless expectant mothers so that they are protected from problems during delivery. When one realise the benefits of being truthful, one will naturally refrain from lying. As an additional precaution, one will refrain from engaging in deeds which would later require one to lie. One would even avoid those people, things or situations that may tempt one into situations which would cause one to lie. Therefore, the virtue of truthfulness can prevent us from many vices! Telling the truth becomes imperative when we recognise that the practice will eventually give our words creative power. Our prayer will become powerful, especially when we pray for the well-being of others. Even our enemies will be converted to our friends when we pray for them. When we understand this and see its benefits, telling the truth becomes natural and effortless. Sometimes it is easier to lie than to tell the truth but we must keep in mind that if we lie, we are actually surrendering the creative force that being truthful grants us. That is a big sacrifice indeed. By the truth shared in this article, may you, the reader, have happiness and the causes of happiness. May you be free from suffering and the causes of suffering. A well concised written article, eloquently narratting the fundamental aspect of one’s true nature. If there is no truth in what you say,then don’t say it. You are untruthful to yourself and the father.